Yesterday, the Dallas Art Fair officially entered its second decade as nearly 100 exhibitors from across the world set up sculptures, paintings, photographs, and installations within the booths of downtown’s Fashion Industry Gallery (F.I.G.). In its 10-year history, the fair has grown from a grassroots effort to a major event on Dallas’ calendar, complete with accompanying parties, institutional partnerships, a city-wide footprint, and now a permanent gallery called 214 Projects in the Design District. 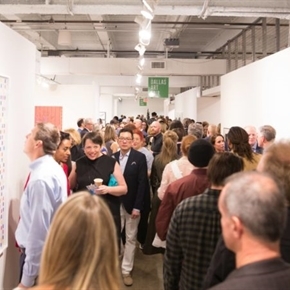 This year, the four-year-old Dallas Art Fair Foundation Acquisition Program used a donation of $150,000 to acquire new works at the fair by Sheila Hicks, Don Dudley, Arcmanoro Niles, Samuel Levi Jones, Nobutaka Aozaki, Emmanuel Van der Auwera, Maja Ruznic, and Dike Blair, all of which will be added to the Dallas Museum of Art’s permanent collection. If you’re looking to acquire some artwork yourself–or just get the most out of your Dallas Art Fair experience–we have a few quick picks from this year’s spread. The fair is giant, probably too big to comprehensively view in one visit (though it is a fun place to wander and get lost), so it’s helpful to have some kind of cheat sheet. Feel free to use this. Cassina Projects (New York) is one of many first-timers at this year’s fair, displaying modern works by Marcel Eichner, Gerold Miller, and Yves Scherer. This invigoratingly vibrant red square, set 296 by Miller, was my favorite of the lot. Lisson Gallery (New York, London) is another heavy-hitting newcomer, with significant works by Marina Abramovic, Ai Weiwei, Anish Kapoor, Tony Cragg, and many more. There’s a pretty, brass-hued mirror sculpture by Kapoor (the guy behind Chicago’s bean sculpture) that I hope some lucky Dallasite snags. STATE (London) has also made an impressive debut this year, featuring artists like Yayoi Kusama, Jean-Michel Basquiat, Pablo Picasso, and Damien Hirst. As far as local newbies, we have 12.26 (in the new River Bend development), the recently opened Sean Horton (presents), and Sputnik Modern, which specializes in 20th century art and design. Dallas’ Conduit Gallery has returned to the art fair with a strong roster of artists including Maja Ruznic, Annabel Daou, Ted Larson, and Fahamu Pecou, whose oversized portrait of a woman in feathers was one of my favorite pieces of the day. It’s also worth stopping by the booths of Dallas galleries Photographs Do Not Bend (one of the rare photography-focused exhibitors at the fair), Galleri Urbane Marfa + Dallas, AND NOW, Galerie Frank Elbaz, Cris Worley, Erin Cluley, Liliana Bloch, and Valley House Gallery & Sculpture Garden. But, then again, the beauty of the art fair is that you can see things that wouldn’t usually be found in our own city. Some of my favorite returning visitors were the always chic Perrotin; James Cohan, especially this tactile piece by Xu Zhen; New York’s The Hole, which has a gigantic Big Tex painting that some Texan desperately needs; and Detroit’s Library Street Collective, which has created a warm and immersive experience in its little space. The Dallas Art Fair officially opened to the public on Friday morning. It’s open Friday and Saturday from 11 a.m. to 7 p.m. and Sunday from noon to 6 p.m. One-day admission is $25. Find the full schedule of Dallas Art Fair events here.